The control-mastery theory, developed by Dr. Joseph Weiss over the second half of the twentieth century, is an attempt to integrate an understanding of how the mind works, how psychopathologies develop, and how psychotherapy can effectively help. Control-Mastery theory assumes that the patient's problems are rooted in the grim, constricting pathogenic beliefs that the patient acquires in the traumatic experiences of childhood. The driving force behind the psychotherapeutic process is the patient's conscious and unconscious desire to recover the capacity to pursue life goals by gaining control and mastering self destructive patterns of thoughts and behaviors. Underlying this theory is the conception that the client structures (both consciously and unconsciously) the psychotherapeutic process in order to clearly and quickly address her own goals. Following this line of thought, the practitioner must be able to identify a client's aims, respond to and encourage these thoughts, and develop a strategic therapeutic plan to effectively address the needs and wants of each individual. This book aims to present the control-mastery theory in a more accessible format, and introduce it to a wider audience, expanding the scope of the theory beyond simply a comparison to Freudian analysis. The text presents an integrated cognitive-psychodynamic-relational approach to therapy, addressing issues surrounding psychopathology and pathogenic constructions. Organized into three distinct sections, the book first considers theoretical underpinnings before moving into in-depth discussions of clinical and practical application of these valuable therapeutic tools and techniques, drawing heavily on detailed descriptions of entire therapy sessions. The final section of the book covers current and developing empirical research, presenting convincing arguments in support of the theory and practice earlier discussed. The editor has extensive research and clinical experience with both the conceptual and practical aspects of the theory, and has worked with Joseph Weiss and Hal Sampson - the two pioneers of the control-mastery approach - who each contributes a chapter to the book. 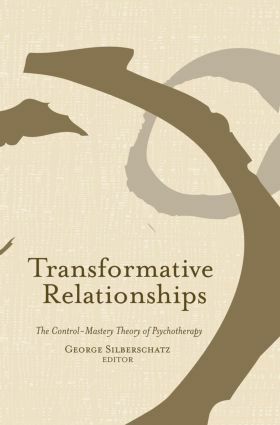 Transformative Relationships advances this integrative approach to therapy beyond its current scope, introducing these valuable concepts and techniques to a wider audience of practitioners of all backgrounds.